I am asking how well the Hx measure is tracking resistance and to avoid confusion I should have added “noting it is represented as an inverse ratio (conductance or susceptance)”. Sorry I didn’t add that. I am not suggesting it is a direct measure and never considered it has units of Ohms or even Siemens. With the new values of 115 appearing for the 40kWh it is possible this has not been scaled and this pack has 15% less resistance than the 30kWh. However, it seems to me unlikely the 30kWh was the same as the 24kWh when new. What we are seeing is low Hx on the 30kWh and if this is representing the change of resistance as a linear measure (e.g. 100/58.34=1.7x more resistance than new) it is a lot. For a car that has been restored to 82% SoH with the update there are valid concerns about the “health” of the battery. Some help from battery scientists may be needed. I understood by the time the resistance had risen to 2 to 2.5x when new it was starting to get into the later stages of Lithium plating but this may be wrong. Hopefully Hx isn’t a linear measure and resistance hasn’t risen that much. Any other insights welcomed. To help better understand Hx I am adding some new capabilities to LeafSpy Pro. Here is a graph of data captured with the next version of LeafSpy Pro I am working on. Blue is voltage and Read is battery amps. 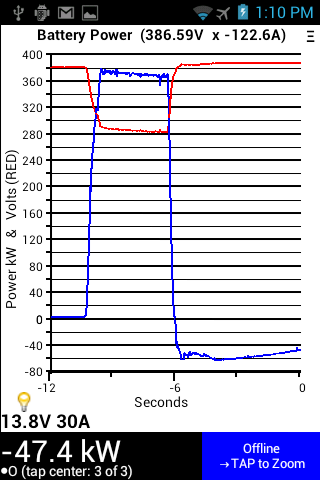 This is of a full power run on my 2011 Leaf Hx of 38.36. You can see the Leaf limiting power to the motor at the start. 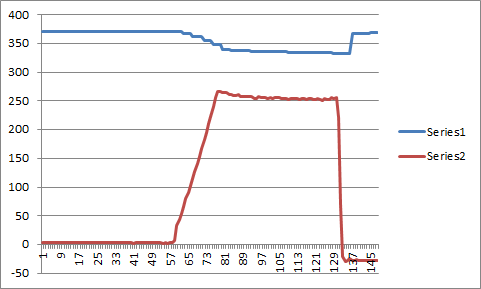 The voltage drop should be directly related to the internal resistance of the battery. As you can see this version of LeafSpy supports sample rates 30 times faster than the current version (even with logging enabled). This is accomplished by read data from only a single ECU. So the data logged is limited to what the ECU provides for that CAN message. It would be interesting to see what a new 2018 Leaf graph would look like. TM-Spy can generate the same graph for a Tesla. Unlike Nissan Tesla does not limit the power to the motor at the start. Last edited by Turbo3 on Tue Jul 24, 2018 7:21 pm, edited 1 time in total. Will TM-Spy work with the Model 3? Hope to get M3 next month. There is a good chance I can get something working for the Model 3 once I learn more about it. As I understand it, some wiring will be needed to connect to the CAN bus as there is no connector. Turbo3 wrote: To help better understand Hx I am adding some new capabilities to LeafSpy Pro. The key parameter to know, though, is the battery temp when the data were taken and the vehicle's age/mileage. My Leaf at 65k and 26 C has a resistance of about 84 mohms. Once LeafSpy is updated for this feature, I'll compare it to LeafDD. the immediate battery voltage divided by the peak start charging current. The measured resistance was about 100 mohms. That test obviously would not be as good as the proposed LeafSpy test. Turbo3 wrote: You can see the Leaf limiting power to the motor at the start. Is that the ramp when the current rises or is it something else?? Yes, you can see it jump up to 25 Amps but then slowly ramp up to 250 Amps. Input was accelerator pressed to the floor after the light turned Green. Is the graph from your 2011, just flooring the accelerator? If so, I suspect the later models will show slower current ramping. I noticed slower acceleration with the 2015 compared to the 2011 as soon as I got it. Someone told me to feather the accelerator on the 2015 to get best acceleration--done right, it is almost as quick as the 2011. I will try it with my 2015 as soon as I get the updated Leaf Spy. Great news. This parameter is confusing and your efforts with LeafSpy are really appreciated. The following data from the https://flipthefleet.org/ database might help understand the spread we are seeing here in New Zealand. The labels may be confusing where Gen1 are MY2011-2012 and Gen2 are MY2013-2017. There are also a few data points from 2018 cars which show a significant drop in Hx over the last 5 months (e.g. start at 115, drop to 105) so for those cars the reported Hx is more of a mystery. The INL data from https://avt.inl.gov/vehicle-button/2013-nissan-leaf provides some insight into variations of resistance for different SoC and it seems filtering results for mid range might provide more consistent answers and ideally any records would be labelled with SoC . As mentioned above, recording of temperature is also valuable. Keep up the great work. Turbo3 wrote: As you can see this version of LeafSpy supports sample rates 30 times faster than the current version (even with logging enabled). This is accomplished by read data from only a single ECU. So the data logged is limited to what the ECU provides for that CAN message. This is great work. Can you please clarify the sampling rates now possible and when this version might be released?